Dr. Bruce Mann has been practicing Interventional Pain Management for over 20 years at the highest level. As a dual Board Certified Anesthesiologist and pain management from Columbia University, he brings an unparalleled level of professionalism, enthusiasm and technical acumen. The Spine & Orthopedic Center was founded with the intention of combining cutting edge technology with multidisciplinary specialty physicians to supply patients with the comprehensive center that provides the very best outcomes. Our mission is to provide superior quality care, personalized service, and education to the patients so they can confidently make informed decisions about their treatment plan and lifelong wellness. SOC is fully equipped for diagnosing and treating severely debilitating spinal problems, including a high-field MRI, digital X-ray and fluoro technology, a state accredited sedation procedure suite, and an on-site CLIA & COLA accredited laboratory. This allows our team to successfully handle almost any type of spinal condition and treat it accordingly. Due to the sedation being offered in our office, procedures such as kyphoplasty (cement) for compression fractures, radiofrequency ablation (RFA) for neck and back pain as well as epidurals can now be performed on a comfortable, immediate and outpatient basis. 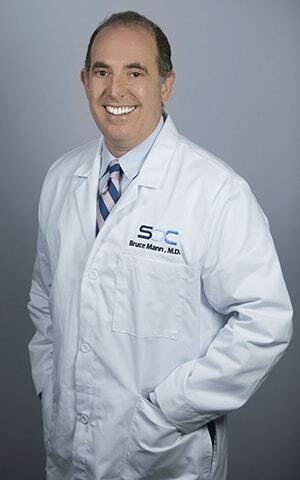 SOC welcomes Dr. Bruce Mann in fulfilling its mission of exemplary care. Dr. Mann specializes in most chronic and acute pain syndromes including shoulder, neck, and lower back pain, Complex Regional Pain Syndrome, Peripheral Neuropathy, headaches, cancer pain, pinched nerves and pain associated with auto and work-related injuries. Given his extensive experience, his treatment methods include: Epidural Steriod Injections, Spinal Cord Stimulation, Transforaminal Epidural Steriod Injections, Selective Nerve Root Blocks, Disc Annuloplasty, Discography, Facet Radiofrequency-Coolief® Radiofrequency, Sacroiliac Joint Injections and Radiofrequency, Peripheral Nerve Blocks and Radiofrequency, Geniculate Nerve Radiofrequency for Knee Pain, Sympathic Plexus Blocks (Abdominal Pain, Pelvic Pain and Complex Regional Pain Syndrome) and Epidural Lysis of Adhesions/Neuroplasty.